In the James Bond flick "Diamonds Are Forever," Bond tastes a Mouton Rothchild served by his enemy disguised as a room service waiter, and says, "The wine is quite excellent. Although for such a grand meal I would have expected a claret." Mr. Wint responds, "But of course. Unfortunately our cellar is poorly stocked with clarets." "Mouton Rothschild is a claret," retorts Bond. "And, I've smelled that aftershave on you before and both times I've smelled a rat." In "Dr. No," some champagne is poured into triangular flute, and when Bond becomes agitated, Dr. No says, "That's a Dom Perignon '55 - it would be a pity to break it." Bond coolly sits down, raises one eyebrow, and says in that great Sean Connery accent, "I prefer the '53 myself." Yes, I admit it. Up until "Sideways," everything I knew about wine I learned from James Bond, the main lesson being his palate was waaaay more refined than mine could ever be. Wine in all its various forms can be incredibly intimidating. No one wants to look like a bumpkin who can't tell his clarets from his Cabernets. But seriously, do wine experts really possess skills we mere mortals can only fantasize over, or is determining good wine from bad really not so complicated? #New Times had to get to the bottom of this mystery (God my job's hard! ), so we did what any sensible newspaper would do; we corralled two experts, two admittedly ignorant albeit experienced wine drinkers, and two young wine-experts-in-training and set them loose on 12 bottles of vino in a blind tasting. We drank three "flights" of wine, as they're called, with four bottles per flight. One bottle was under $10, one $10 to $20, one around $30, and one over $50. The idea was to see if we could agree on how to rank the wines from best to worst, and if we could correctly guess each wine's price point. Our experts were local wine guru Archie McLaren and New Times' own food and wine expert Kathy Marcks Hardesty. New Times sales associate Kerry Moore and I acted as the experienced wine drinkers who consider ourselves parvenus. Cal Poly students Mike Loconto and Elizabeth Tangney, both earning viticulture minors and members of the university's "Vines to Wine" club, were our experts-in-training who were learning a lot about wine but at 21 hadn't had a lot of practice at drinking the stuff. Kathy's husband Dan was nice enough to purchase the wine selection, and Dan and Kathy hosted the event at their South County home. Also on hand was New Times photog Christopher Gardner, who was nice enough to help drink some wine, too. I knew I was out of my realm when Kathy said her house would be a good location because she had the proper stemware. I'm not averse to drinking wine out of a tumbler (I also frequently eat over the sink â€¦ classy, no?). Then when I e-mailed Archie to tell him Kathy was going to serve us dinner - her famous chicken enchiladas - Archie wrote back to say we should eat after the tasting so as not to affect our palate. Stemware? Palate? I was doomed. James Bond, where are you? I need your expertise. I think young Mike and Elizabeth were as nervous as I was, but Archie and Kathy quickly put us at ease. Wine experts aren't snobs, they just like to have fun and be social. 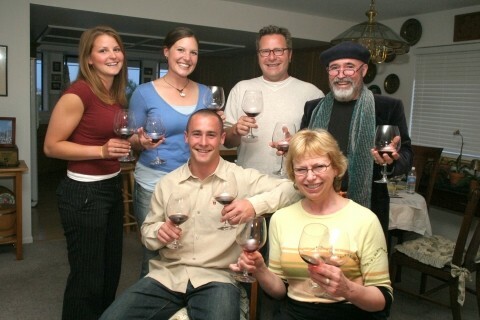 We each had four glasses in front of us, and we poured the first selections into the glasses. We knew they were Chardonnays, but that's all we knew. We sniff. We swirled. We sipped. We drank. We weren't allowed to verbally comment on the wines until we had each ranked them on our score sheet. Archie, Kerry, Elizabeth, and I all correctly picked the $50 Flowers Chardonnay as the best, yet Kathy ranked it as the worst and Mike ranked it third. The $32 Patz & Hall collected a mix of scores, ranking first with Kathy and second with Archie while most of us thought it the worst! Everyone but Archie, who correctly ranked every wine in this flight, thought the cheap $8 Meridian was the second best wine in the lot. Archie also commented on the temperature of the wine, noting that if you're going to serve "something really dreadful," to make it as cold as possible since that masks the taste. Good advice for wine-in-a-box drinkers. In a nod to "Sideways," out next flight was Pinot Noirs. We set to tasting. "The Pinot is the king of food wines," said Kathy. "And the king of sensual wines," added Archie. "The great ones can be scintillating, but everything below great can be dicey." "Aren't Pinots supposed to have a big nose?" ask Chris in between snapping photos. "No, just French people," retorted Archie. Clearly the wine was beginning to have an effect. We commenced to drinking the Pinots, and everyone agreed that one in particular was extremely nasty, earning comments like "a gnarly barnyard smell." "It smells like they didn't clean their bloody barrels," said Archie. "I prefer to not have something that smells like a cow turd in my wine. It's so weird, though, that I think this might be the most expensive wine." 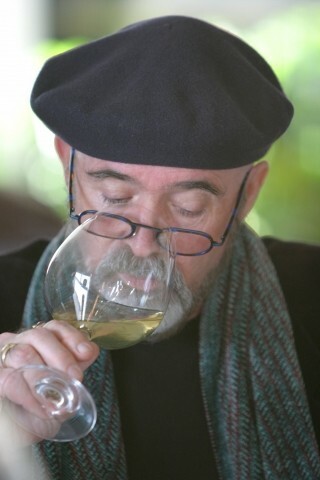 THE NOSE KNOWS: Central Coast Wine Classic founder Archie McLaren proved best at determining more expensive wines from least expensive. #Interestingly enough, it was! The $50 2001 Longoria pinot smelled like poop. When it was finally revealed, Archie and Kathy were aghast. Longoria is apparently a great winery and this had to be a bad bottle. A few days after the tasting, Archie wrote to say, "If the Longoria had not been a spoiled bottle, and had manifested its true qualities, I believe that it would have stood above the others in the Pinot Noir flight." Archie also noted that Pinots can be much better than any we had tasted that night. "When it happens, it's amazing." We finally moved onto our final flight, the Cadillac of wines, Cabernet Sauvignon. We had sort of abandoned our rule of not talking before rating the wine, and Elizabeth noted the first in the flight, the $30 Honig, was "smooth" and "went down easy" and "was easy to drink." You said it, sister. After sampling a few bottles, really trying to determine different flavors and tastes, it became more and more fun, and we became more and more comfortable, offering our opinions. On the next wine - $65 Arietta - Elizabeth found it "softer" and more "tart." She didn't like its "stickiness." We were discovering that whatever words you want can be used to describe wine. For instance, on the final wine of this flight - the $10 Bogle - Archie called it "overripe and flabby," adding that "flabbiness isn't next to godliness." "That's what's so interesting about wine people," said Elizabeth. "They find such interesting ways to talk about it." "We're all on a learning curve," said Archie. "All of us." We live in some great wine country, and most wineries have tasting rooms open to the public, but to really learn about wine differences, nothing beats a wine festival. There have already been a few this season, but a couple big ones still await. The 23rd Annual Paso Robles Wine Festival is scheduled for this weekend, Friday through Sunday, May 20-22. Tickets are $40 and include a commemorative wine glass and 10 tasting tickets (additional tasting tickets are available at the Park for $1 each). Buy tickets at all Central Coast Santa Lucia Bank locations and Chambers of Commerce in Atascadero, Cambria, Morro Bay, Paso Robles, and San Luis Obispo. The Central Coast Wine Classic is scheduled for Thursday through Sunday, July 14-17. An array of events at the Cliffs Resort at Shell Beach, Hearst Castle in San Simeon, and Tolosa Winery in the Edna Valley near San Luis Obispo are on the slate. Learn more about this event at www.centralcoastwineclassic.org. We also discovered that the Arietta, which right into the glass didn't taste so great to any of us, became the best wine in the flight after it had more time in the glass. That whole "letting a wine breathe" stuff is for real, at least for some wines. Archie noted that merely uncorking the wine isn't enough, which only gets air to the dime-size bit of wine at the top of the neck. A wine in need of air really needs to be decanted. "The third flight was also complicated by the fact that the Arietta, a blend of predominantly Cabernet Franc and Merlot, needed time in the glass to open and become more accessible," wrote Archie a couple days after our tasting. "In fact, after tasting the wine, which as you know became better and better as the evening progressed, I would not open another bottle for at least three years, so that the tannins will soften and make the wine's complexities even more accessible. Of all the wines we tasted, the Arietta will no doubt be the most long-lived, perhaps 15 years or more. At any rate, although I was able to pick the correct pricing order for the first two flights, I originally judged the Beaulieu as more expensive than the Arietta, that is until the Arietta began to open." WINES ON PARADE: Sixteen bottles and countless brain cells were sacrificed to bring New Times readers the truth about wine expertise. #Even Archie isn't infallible, though among us he came closest - were it not for a bad Longoria, he would have correctly guessed the price points for all wines, and indeed, in general more expensive wines were mostly ranked better by experts and amateurs alike! Sure, there were a few exceptions, like the $10 Bogle that Elizabeth, Mike, and I thought was best, and the $8 Meridian Chard that everyone but Archie ranked second in the flight. Even after the evening ended, I still wondered about price, and Archie had a plan to answer the question once and for all. "The Beaulieu Rutherford was a surprise, as it seemed to me to represent a style and quality that would have fetched a price in excess of $18.99. In that respect, the BV was probably the bargain of the tasting. Actually, BV produces several other Cabernet Sauvignons or Bordeaux varietal blends that are held in higher esteem and are substantially more expensive. I wonder if their quality is perceptibly higher than the one we tasted. It might be of interest to you to go to a grocery store and buy, each from the same vintage, the one we had and one called Beaulieu Vineyards Georges de Latour Private Reserve Napa Valley Cabernet Sauvignon (significantly more expensive at about $80) and compare their relative merits." We met at Archie's Avila Beach house and uncorked the bottles. They both tasted really good. "Wines today aren't meant to last too long," explained Archie. "Most will go five or six years, 12 tops." 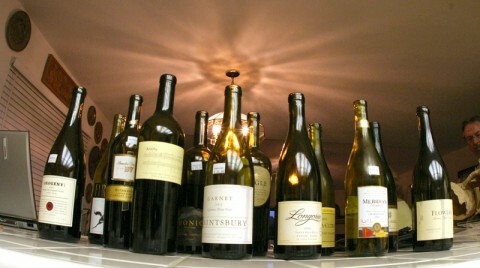 More expensive wines are usually made to last longer. I sipped and drank and sniffed, but honestly I was having a hard time discerning much difference between the two. Again, I knew Bond wouldn't have this problem. "There's an aura that's grown around the wine industry, so snooty," said Archie. "We're not afraid of food but we're afraid of wine, especially when we drink with someone else or even when we're getting the help of a sommelier." For someone like me, who likes wine but whose palate lacks sophistication, I feel like a poseur. Swirling and sniffing? What's the point, right? Well, according to Archie, there's nothing to fear because no one can know everything about wine. "There's no such thing as a wine connoisseur in that wine is too vast a subject and wine is always changing. There's no one alive like James Bond, who would have the time or resources to taste all the great wines. There's too many and they go back too far." As I continued to sip between the two BVs, I did start to notice some subtle differences. The more expensive of the two started to feel more velvety. The less expensive one's various tastes seem to end more quickly in my mouth. Still, was it a difference worth $60? Probably not to me. I've got bills to pay. I asked Archie why he never got into winemaking himself. "The whole thing about life is the juxtaposition. Why drink the same thing every night? Music is as much about silence as it is about sound. Without silence, music wouldn't be observed." Hmm. Maybe Robert Louis Stevenson was right when he said, "Wine is bottled poetry." Am I still intimidated about wine? Sure, but I know now that true wine lovers aren't interested in making a beginner like me feel dumb. Instead they just want to share their love of and interest in this incredibly complex experience. Glen Starkey wants to reassure the beer industry that he hasn't abandoned it. Send your heartfelt thanks to gstarkey@newtimesslo.com.